Theologian Robert W. Jenson died this week, after a very productive life of writing theology. His contributions to the field are numerous and wide-ranging, and yet his life-work had a remarkable coherence and focus. There’s an identifiable set of Jenson proposals out there to be dealt with by serious theologians. As he himself said, “it is the fate of every theological system to be dismembered and have its fragments bandied about in an ongoing debate” (ST 1:18). In my opinion we are still in the period of Jenson reception, dismembering his proposals and bandying them about. Some great work has been done in the field of coming to terms with his theology, and more continues to be done (I’m looking forward to this new book, for instance). Jenson also said that any theologian’s system of theology should be “tested against Scripture by its success or failure as a hermeneutical principle for Scripture taken as a whole, as one great text with a very complex internal structure” (ST 1:33). That’s exactly right. Theologians labor for a lifetime on a system as cogent and coherent as possible, and then wait to see if it actually helps the church read and construe what is there in Holy Scripture. Some of Jenson’s major theological maneuvers are not ones that I found persuasive in this regard. I don’t say this lightly, because for various reasons I am strongly attracted to a great deal of his work, and am always instructed by it. I also don’t say it with any intention to substantiate the bare assertion in a little blog post in the week of his death. I’m actually just blogging about him to share three of my favorite Jenson moments from the arena of theology conferences and journals, which is the arena where I knew him. I started attending theology conferences when Jenson was still a regular presence at them: he and his wife Blanche were a fixture at innumerable paper presentations, and hosted the annual Pro Ecclesia reception back when it was the most interesting gathering at AAR/SBL. As Jenson became less able to travel in these later years, it was a palpable disappointment not to see him and Blanche annually. One: Jenson performed the best mic drop moment I’ve ever seen at a theology conference. Okay, he didn’t actually drop the mic: he was on a panel of speakers with only one microphone, so they had to take turns going up to the podium to answer questions from the audience. One of the questions was a little bit longwinded, but truly in earnest: the questioner wanted to know what Jenson thought about recent historical Jesus scholarship that claimed Jesus was not so eschatologically-minded, or Hebrew prophety, or apocalyptic, as previously thought. If Jesus were in fact more of a wandering Hellenistic cynic philosopher, wouldn’t that undercut Jenson’s appeal to the teaching of Jesus, and undermine his theological position? What, the questioner asked, is that status of this compelling “Jesus as Cynic” research? Jenson shuffled up to the podium, looked thoughtful, leaned in to the mic, and pronounced a single word very clearly and curtly. It’s a compound word. It’s about the excrement of the male bovine. Then he went back to his seat. Two. 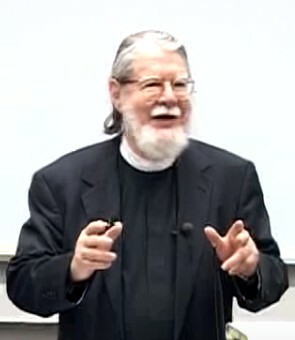 Jenson made the same gesture of strategic dismissal, but in print, when he responded to a detailed 14-page review of the first volume of his Systematic Theology in a 1999 issue of the Scottish Journal of Theology. The review (which, in my estimation, did lodge some valid and serious criticisms) was itself an attempt to ignore some of Jenson’s central proposals for reconfiguring how we should talk about christology and the Trinity. Jenson, in other words, proposed a game, and the reviewer responded at length with a refusal to play the game. So Jenson wrote a two-paragraph reply, easily printed on one page with lots of white space above and below, saying as much. Now of course I think public claims should be publicly adjudicated, and serious critiques should be seriously engaged. But Jenson is one of the few theologians of recent decades to write with real literary style, and to have a well-developed sense of genre. In this case, he used a rare genre (a shockingly brief seven-sentence response to a review article) to dramatize the point that some people just talk past each other. He closed off the dialogue in an unpredictably productive way, it seems to me. The tiny essay “Reply” is reprinted as the first chapter of the Jenson collection Theology as Revisionary Metaphysics, because editor Stephen John Wright correctly takes it to be an appropriate mini-manifesto of an enduring motif in Jenson’s work. As an evangelical reader who has benefited from Jenson and also the similar-in-many-ways Pannenberg, I’ve long since developed the ability to mentally compensate for the fact that these authors just aren’t operating with the same doctrine of Scripture that I am. I try to be alert to when it matters and when it doesn’t; that is, when the deviation from a traditional view of Scripture’s perfection does or doesn’t materially distort the elements of one of the doctrines under discussion. Call it critical eclecticism, or call it my own personal way of dismembering and bandying about the fragments of a system; I suppose we all do something like it when reading each other. 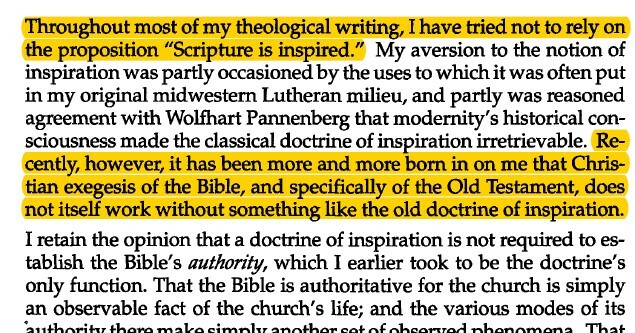 But having long since settlled into that mode of reading, I was shocked and, I admit, delighted, to find Robert Jenson, after publishing his Systematic Theology, confessing that he had gone on to see a need for a doctrine of Scripture’s inspiration. That short 2004 essay “A Second Thought About Inspiration,” offers some creative and interesting leads on how Jenson would develop one: it’s a refreshingly Old-Testamenty angle of approach, well worth pondering. Of course I’m gratified to see Jenson move closer to a position I hold. But really I’m just impressed that he could easily admit his big, impressive, two-volume theological system had missed something important. I’m impressed that a forceful personality like Jenson, who knew what irascibility was, also knew how to keep learning, and how to admit he hadn’t seen everything quite right. I don’t have it in me to write a full treatment of Robert Jenson’s theology; I’ve grappled with it off and on in several books and articles over the years. But I’m grateful for his work and will sure miss his interventions into the comings and goings of contemporary theology.